Though clearly a love letter to the French company's high-end cookware, the delicious recipes contained therein will work just as well in the humblest pots and pans. The Staub Cookbook, copyright © 2018. 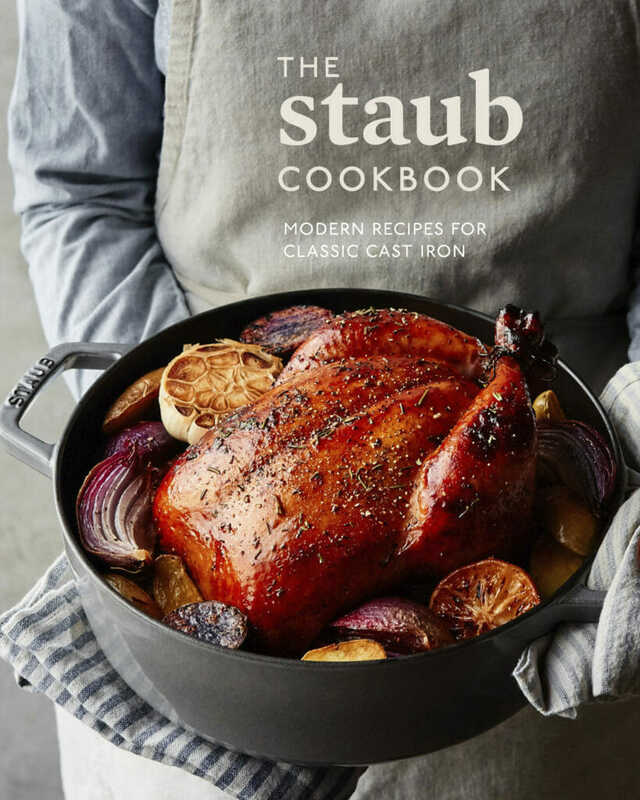 Even heat and a good sear, the hallmarks of cast iron, are shown to their best advantage in the 240-page hardcover, which includes recipes from the Staub kitchens as well as contributions from chefs, bloggers, and food writers who are fans of the company’s cookware. There are French classics, like coq au vin and beef bourguignon, as well as modern time savers – most notably Jim Lahey’s no-knead bread, which is baked in a cast-iron pot to achieve it signature crispy crust. Likewise, the book offers dozens of elevated weeknight dishes, including chicken meatballs in a red coconut curry sauce by Louisville-based chef Edward Lee, garlicky shrimp grilled from bestselling-author Julia Turshen, and baked ricotta with chives, a specialty at Julia Sullivan’s Nashville restaurant Henrietta Red. And the inspiration goes well beyond savory: There are any number of easy-to-assemble skillet desserts, including tarte tatin, pineapple upside-down cake, and cherry clafoutis paired with crÁ¨me fraiche whipped cream. Hungry? Read on for three of our favorite recipes from the book. Reprinted with permission from The Staub Cookbook, copyright © 2018. Photography by Colin Price. Published by Ten Speed Press, and imprint of Penguin Random House. 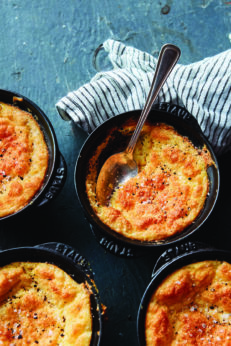 Grits can, of course, be prepared with just salt and butter, but the Southern classic becomes transcendent when Justin Devillier, the chef-owner of La Petite Grocery in New Orleans, gives the dish a French spin. As you would with a soufflé, he incorporates whipped egg whites to add volume, then folds in aged Cheddar to give the dish extra flavor. Preheat the oven to 350°F. In a 4-quart cast-iron cocotte or stock pot over medium-high heat, combine water, milk, butter, 1 teaspoon salt, and pepper and heat until mixture is steaming but not quite boiling. Add grits in a slow, steady stream, whisking vigorously, to prevent lumps from forming. Once all of grits have been added, bring mixture to a boil, then immediately reduce heat to low; cook, stirring occasionally, for about 20 minutes, until grits are thickened enough to stick to the back of a spoon but not the bottom of the pot. Add cheese and fold to incorporate. Remove from heat. While shakshuka, a classic North African recipe, is typically eaten for breakfast, it makes for an easy weeknight dinner as well. Instead of using tomatoes, cookbook author Molly Yeh cleverly substitutes kale and lemon in her recipe to create an earthy, delicious green version. She likes to serve the dish in individual cocottes, but you could easily swap them for a 12-inch cast-iron fry pan. Serve with a drizzle of yogurt and a sprinkle of za’atar, plus crusty bread for dipping. For serving: Greek yogurt Za’atar Chopped fresh flat-leaf parsley Crusty bread 1. Preheat oven to 350°F. In a medium cast-iron cocotte, heat oil over medium heat. Add garlic and paprika, and cook, stirring for 30 seconds; add kale in 2 or 3 batches, allowing it to wilt slightly before adding more. Add a pinch of salt and cook, stirring often, until kale is softened, 7 to 9 minutes, Stir in the stock and cook until slightly reduced, 5 minutes more. Add feta, black pepper to taste, a pinch of red pepper, and lemon juice. Taste and adjust seasoning as desired. 2. 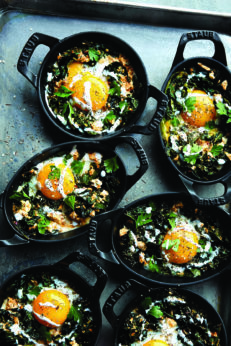 Distribute kale mixture among 6 mini cocottes (or 12-inch fry pan or cast-iron ramekins) and create a well in center of each. Crack an egg into each well and bake uncovered until the whites are cooked but yolks are still runny; begin checking for doneness at 12 minutes. 3. To serve, top each serving with a drizzle of yogurt and a sprinkle of za’atar, parsley, salt, and pepper. Serve immediately with crusty bread. 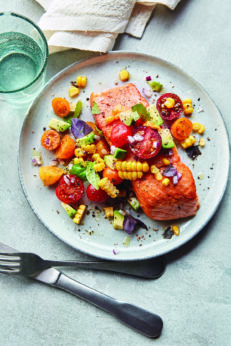 For perfectly cooked fish with the crispiest skin ever, blot any excess moisture from the salmon with a paper towel, then use a very hot, liberally oiled cast-iron skillet. In a medium bowl, combine tomatoes, corn, avocado, onion, basil, lime, 1 tablespoon oil, and pinch of salt and pepper. Toss well and set aside. Heat a large cast-iron fry pan over medium-high heat and add remaining oil. Pat salmon skin dry with a paper towel and run a knife gently along skin to, removing any excess moisture but being careful not to cut skin. Season with salt and pepper to taste. Add fillets to pan, skin side down, and cook for 3 to 4 minutes, then flip and cook for 1 minute more, or until a paring knife can be easily inserted into flesh without any resistance. Arrange salmon on plates, top with salsa, and serve immediately.